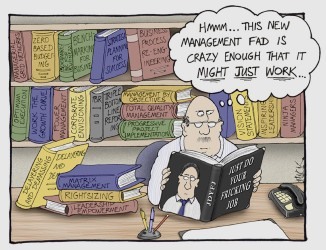 We live in an era where management and leadership books are ubiquitous. It is a multi million pound industry. Most of us are sceptical of the myriad management theory being trotted out daily, and with it, the new language they have spawned, what Rosabeth Moss Kanter calls “managementese”. But yet, like the Sun newspaper, people continue to buy them! Perhaps worse than the proliferation of “managementese” is the pseudo-scientific assumption behind the theories, ie, that organisations are machines that can be re-tuned, fine-tuned and re-engineered by clever managers and leaders. I for one think that there are good reasons to be wary. If we embrace these views uncritically, the values they represent may inadvertently form our “constitutive” beliefs. That is, beliefs that then informs and govern our thoughts; how we view the world; and, consequently our behaviours and actions. In the 1990s privatisation in the UK brought managerial and commercial practice into the public sector. This has now spread into education, medicine, religion, politics, art, sport and leisure. As a consequence, the language of market transactions has colonised our belief system, even our social constructions of love, affection and personal identity. It would seem that for us, commerce, culture and self have become inextricably combined. Business has become such a dominant force in our society that the West is now characterised as “business culture”. I’ve heard it said that in this “business culture”, the management/leadership gurus are the “unacknowledged legislators of our minds”. Their injunctions have a psychological hold on us… governing how we think, refashioning our language and even creating the norms and criteria for human relationships. Dare I say these values also govern the iNGO sector today, even the Christian ones. If this is so, we need to ask ourselves how it has influenced our views about poverty, ie, what causes it; our own part in it; how we alleviate it; and our solutions of how it can be eradicated? Rather than collude with a system that created an unequal world in the first place, we should be seeking God’s view about human relationships, and consequently, be prepared to work prophetically to bring this about. This journey begins with asking what a restored relationship with God means, what it looks like and how we can bring this about? Institutional church leaders have had extremely bad press recently. In many cases justifiably so, but nevertheless its a shame, not least because it gives the world an excuse to write them all off. There are, however, some wonderful church leaders, who have been trying to offer a different worldview (God-view) for centuries. One of these is the assassinated Roman Catholic Archbishop Oscar Romero, who wrote a wonderful poem, which for me, rhymes, chimes and resonates with what I’m trying to say here! I love how Rosabeth Moss Kanter, herself her management guru, makes up yet another management word to describe the fact that there are too many management words.